The Chinese zodiac signs dragon and the rabbit seem very opposite and different in nature. Will these two be able to live together? How good or bad will a dragon-rabbit relationship be in the long run? What kind of love compatibility will this couple share? The Chinese dragon sign will be passionate, with a strong personality. They do not mean to be intense but are just used to being in the spotlight. They will be more than happy to be protective of their partner and provide them with the strength they need. They will be able to help keep the practical things in order. They can be nice and capable. The rabbit is timid and might be treated as a pushover by their partner. They have the capabilities for a lot of kindness and intuition. They will have an easier time understanding their lover’s nature than others might. They require a lot of encouragement from their close friends and family to be able to keep their emotions balanced. The dragon and rabbit relationship can be an intimate, affectionate bond. These two Chinese astrology signs might seem different but they can make each other happy. Both will understand what it is to have an encouraging relationship. They can easily share this kind of love compatibility with a little effort. The dragon and rabbit compatibility is optimistic and practical. The rabbit might prefer a low key evening at home. They will give their partner acceptance and love which their dragon mate will appreciate. At the same time, the dragon might prefer to get out of the house. In the dragon rabbit marriage, they will have a very nice home. The male or female rabbit has the capability of being very creative. They love entertaining friends at home but they can be somewhat timid. They might find the practical things like paying bills overwhelming at times. The dragon man or woman can help their lover have more fun and be more impulsive. The dragon and rabbit as soulmates have different personalities. However, the positive traits of one will complement the less positive traits of the other. They will both lead and encourage each other to improve their traits. The male or female dragon will let the rabbit be more dominant. They know that the rabbits will ask for their advice in most of the decisions they make. The Chinese zodiac rabbit man or woman will be driven enough for both of them. They will together have everything they need to have a successful relationship. They have personalities that complement each other. Both will give each other encouragement, warmth, friendship, and protection when they are dating each other. The rabbit will create a cozy home for the dragon to come home to. The dragon will give the rabbit warmth and protection when they are feeling down. The dragon-rabbit compatibility will lead to a good relationship if they focus on their similarities and not let the petty differences get in the way. They will need to accept each other and discuss anything they might have a doubt about before it becomes an issue. Both will be happy if they concentrate on their goals and achievements. In bed, the dragon and rabbit might have good time, provided either is not sexually intimidating. A dragon wife and rabbit husband might not be a very good relationship. The rabbit will be appealing to the dragon but they will need to be respected. However, they will have differences that will be hard to overlook. They will have issues disregarding each other’s flaws and will feel their lover is being demanding because of this. Chinese astrology compatibility predicts that a dragon husband and rabbit wife might have a better relationship. The dragon will find the rabbit being timid appealing. The rabbit will be attracted to the dragon’s giving personality. Their charisma will help if there are any petty arguments. 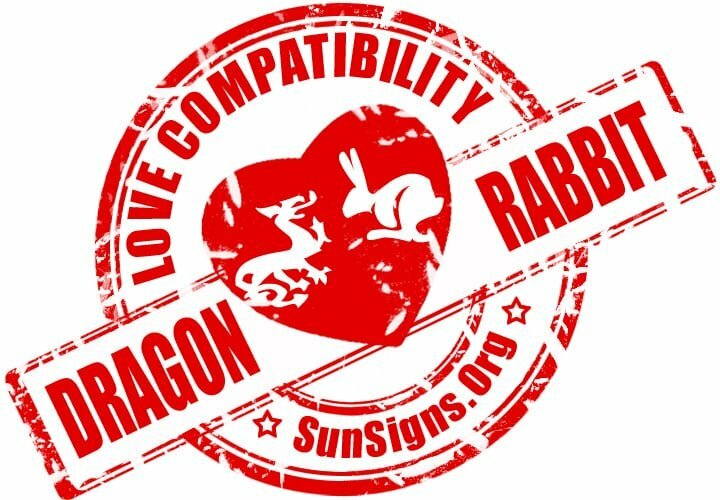 Dragon & Rabbit Chinese Horoscope Compatibility Rated 2 Hearts!